Edward Goodrich Acheson was American inventor who discovered the abrasive Carborundum and perfected a method for making graphite. Acheson was key in successfully establishing at least five industrial corporations dependent on electrothermal processes. Edward Goodrich Acheson, the son of Williams and Sarah Diana (Ruple) Acheson, was born in Washington, PA., March 9, 1856 and was raised in the coal fields of southwestern Pennsylvania. In his youth he attended Bellefonte Academy, Bellefonte, PA., but for the most part he was self taught. As a child, Acheson had been fascinated by engineering and mathematics. His inventive tendency exhibited itself as early as 1872; in that year, at age 16, Acheson filed a caveat with the United States Patent Office for force auger to use in coal-mining operations. His father’s sudden death in June 1873 necessitiated the termination of young Acheson’s formal education. Acheson, still a teenager, was forced to go to work. For the next 7 years he earned his own living in a variety of endeavors and contributed also to the support of his mother and sisters. Surveying gauging tank capacities in Pennsylvania’s oil fields, and mining iron ore in a joint venture with his brother William were representative of the varied nature of his efforts. He also worked on various railroad jobs. Concurrently, he was devoting his evenings to his private scientific pursuits, primarily in the field of electricity. Acheson became interested in the electrical field and decided to work for a manufacturer of electrical equipment. He first applied to Edward Weston who made electroplating dynamos but was turned down. However, one product of his labors was an electric pile, which he brought hopefully to the attention of Thomas Edison. Edison put him to work on September 12, 1880 at his Menlo Park, NJ laboratory under John Kruesi (father of Paul Kruesi ECS Pres. 1928-1929). Acheson experimented on making a conducting carbon that Edison could use in his electric light bulbs. He contributed toward production of the first truly durable incandescent light bulb. Edison recognized his inventive genius and advanced him quickly. After a year he was sent to Europe as assistant chief engineer, where Acheson spent 2 1/2 years building generating plants and lamp factories in Europe. He worked for the Edison interests in England, France, Italy, Belgium, and the Netherlands, as well as in New York. While in Europe he installed the first electric-lighting systems in such public places as Hotel de Ville in Antwerp, Restaurant Krasnapolsky in Amsterdam, Musee du Nord in Brussels, and La Scala Theater in Milan. In 1884 Acheson married Margaret Maher. Five sons and four daughters were born of this union: Veronica Belle, Edward Goodrich, Raymond Maher, Sarah Ruth, George Wilson, John Huyler, Margarret Irene, Jean Ellen, and Howard Achibald. Upon returning to the United States in 1884, Acheson quit Edison and became superintendent of a plant manufacturing lamps that competed with those invented by Edison. Acheson soon was on his own experimenting and inventing many new and useful things. On June 1, 1886, Acheson received the first of the 70 patents he was to be granted in his lifetime. This was for a “conductor of electricity”. He sold the patent to George Westinghouse, who in turn transferred it to Standard Underground Cable Co. for exploitation. In 1884 he began his own experiments on methods for producing artificial diamonds in an electric furnace. He heated a mixture of clay and coke in an iron bowl with a carbon arc light and found some shiny, hexagonal crystals (silicon carbide) attached to the carbon electrode. Because he at first mistakenly thought the crystals were a compound of carbon and alumina from the clay, he devised the trademark Carborundum, after corundum, the mineral composed of fused alumina. In 1891 Acheson built his plant in Port Huron at the suggestion of Mr. Edison, and used the electric generating plant of considerable power to experiment with carborundum. On February 28, 1893, he received a patent on this highly effective abrasive. Later, while studying the effects of high temperature on Carborundum, he found that the silicon vaporizes at about 4,150 C (7,500 F), leaving behind graphitic carbon. He was granted patents for this process in 1896 (Production of Artificial Crystalline Carbonaceous Materials; Article of Carborundum and Process of the Manufacture Thereof Carborundum Patent Numbers 492,767; 615,648). In 1926, the U.S. Patent Office named carborundum as one of the 22 patents most responsible for the industrial age. Not long after that, it was noted that without carborundum, the mass production manufacturing of precision-ground, interchangeable metal parts would be practically impossible. His early product initially was offered for the polishing of gems and sold at a price comparable with natural diamond dust. The new compound, which was obtainable from cheap raw materials and in good yields, soon became an important industrial abrasive. About the same time Acheson made his discovery, Henri Moissan in France produced a similar compound from a mixture of quartz and carbon; but in a publication of 1903, Moissan ascribed the original discovery to Acheson. Some natural silicon carbide was found in Arizona in the Canyon Diablo meteorite and bears the mineralogical name moissanite. In 1894 he established the Carborundum Company in Monongahela City, Pennsylvania, to produce grinding wheels, whet stones, knife sharpeners, and powdered abrasives. However, demand for the product soon exceeded his ability to supply it, so he built a larger plant in 1895 in Niagara Falls. The Carborundum Company was the second company to contract with the Niagara Falls Power Co. Production began on a four-acre plot of land on the upper river about 1/2 mile from the power plant. Edward Acheson’s discovery of carborundum, a highly effective abrasive used in manufacturing, was an important influence in advancing the industrial era. It was found to be a better abrasive than any other known substance except diamond. Carborundum (silicon carbide) is exceedingly hard, synthetically produced crystalline compound of silicon and carbon. Its chemical formula is SiC. Since the late 19th century silicon carbide has been an important material for sandpapers, grinding wheels, and cutting tools. More recently, it has found application in refractory linings and heating elements for industrial furnaces, in wear-resistant parts for pumps and rocket engines, and in semiconducting substrates for light-emitting diodes. In the mid 1890s, in addition to developing carborundum, Edward G. Acheson recognized that at high temperatures, graphite was formed by the decomposition of metallic carbides, specifically, the silicon carbide used in carborundum production. Graphite was an important compound at this time, and was used in the loop filaments for incandescent lamps. The Acheson Graphite Company, which graphitized calcine carbon and anthracite coal, was constructed near the Carborundum plant in 1899. In 1928 this company was merged with National Carbon Co. (now Union Carbide). Acheson also developed a variety of colloidal graphite products (colloidal suspension of particles of graphite mixed in oil or water). Commercial forms were called Oildag and Aquadag manufactured by the Acheson Colloids Co. (now Acheson Industries). 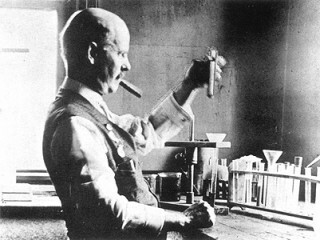 Edward Goodrich Acheson in the lab with his omnipresent cigar, testing Aquadag, a colloidal suspension of his artificial graphite. Acheson was key in successfully establishing at least five industrial corporations dependent on electrothermal processes. Companies which Acheson established for the commercialization of his more important inventions were The Carborundum Co. (1891), Acheson Graphite Co. (1899), International Acheson Graphite Co. (1908), and British Acheson Oildag Co. (1911). His inventive genius knew no bounds; neither did his entrepreneurial optimism. Like many inventors, he was not a good manager, and his companies were constantly being taken out of his hands by concerned investors. Many of Acheson’s original companies live on today, including Carborundum, Inc., UCar International, and Acheson Industries. He was granted 70 patents on devices, techniques, and compositions of matter in the fields of mechanics, electricity, electrochemistry, and colloid chemistry. A steady flow of patents were granted him from the age of 30 to 70. Acheson received a honorary Doctor of Science degree from University of Pittsburgh in 1909. In 1908 the American Academy of Arts and Sciences awarded Dr. Acheson the Count Rumford Medal for his applications of heat in the electric furnace for industrial purposes. He was awarded the John Scott Medal by the Franklin Institute in 1894 for the invention of carborundum, and in 1901 for the invention of artificial graphite. Dr. Acheson also received the Grand Prix at the Exposition Universelle Internationale, Paris in 1900, the Gold Medal at Pan-American Exposition of 1901 for artificial graphite, and the Grand Prize at the Louisiana Purchase Exposition in 1904 for carborundum and artificial graphite. He received the Perkin Research Medal (1910) and hononary memberships in the Imperial Russian Technical Society and Swedish Technological Association (1913). He was a president of The Electrochemical Society (1908-1909) and vice-president of the American Institute of Chemical Engineers. In 1929 he donated to The Electrochemical Society $25,000 to establish the Edward Goodrich Acheson Prize and Medal to be awarded biennially. It is one of the highest honors the Society can bestow. In 1930 he was named the first recipient of his own medal by The Electrochemical Society. Over the years, the Acheson family has provided funds to maintain the Award as prestigeious as any presented by other technical societies. Acheson died in New York City, July 6, 1931. Award-winning American inventor Dr. Edward G. Acheson will be remembered by generations of college students attending classes in the building bearing his name. The Applied Technology Center on the downtown Port Huron campus of St. Clair County Community College (SC4) was renamed the Dr. Edward G. Acheson Applied Technology Center at a dedication ceremony on May 1, 2001. View the full website biography of Edward Goodrich Acheson.